Vicksburg, Miss. 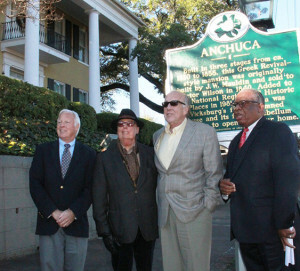 (December 8, 2015) — Anchuca Historic Mansion and Inn, Vicksburg’s first columned mansion and first “home of historic significance” to open its doors “for public inspection,” is celebrating its 60th anniversary with a Holiday Open House and dedication ceremony for its State Historical Marker on Thursday, December 17, 2015, at 9:00 a.m.The house will be open for complimentary tours immediately following the dedication ceremony until noon. All Anchuca gift cards will be offered for sale with an additional 20% cash value added. A full-page article in the “The Sunday Post-Herald” from November 27, 1955, states that as a tourist attraction, the residence at 1010 First East Street will be known as “Anchuca, an Indian name which in the original Choctaw meant ‘My Happy Home.’” In the 60 years since, Anchuca has not only been home to a fortunate handful of owners/proprietors, but it has also been a home away from home for tourists and guests alike, who keep coming back to enjoy Southern hospitality at its finest and all that Old Town Vicksburg has to offer. Pharr also believes this success would have made his maternal grandmother, the late Gladys Marie Garner Barnette, in whose memory the State Historical Marker will be dedicated, proud. The Mississippi Department of Archives and History began this program in 1949, and has placed nearly 900 silver and green markers across the state to identify and interpret historic sites. 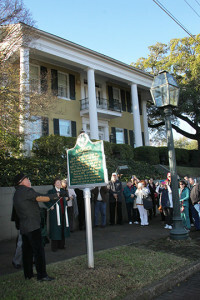 Notably, town legend proclaims Anchuca’s front balcony was the site of one of Jefferson Davis’ last public addresses to friends and neighbors in 1869, while his brother Joseph E. Davis was in residence at the home. Mr. Bertram Hayes-Davis, great-great-grandson to Jefferson Davis and president of the Jefferson Davis Foundation, and his wife, Carol, will help with the dedication ceremony. The Davis’ stop in Vicksburg is planned as part of an exclusive tour of Jefferson Davis sites along the Mississippi River from New Orleans to Memphis on the American Queen steamboat. Today, Anchuca, regularly voted Best of the Best for B&B in the “Vicksburg Post’s” poll, boasts 10 beautiful guest rooms and an award-winning Cafe, as well as a gorgeous backdrop for many special events.